This guy was one of the characters of the sixties. His act was a mixture of horror rock and slapstick humour. His usual decor was leopard skins, large bull horns and long black hair - in the early days his backing group The Savages carried him on stage in a black coffin which he'd crawl from screaming. This sequence was the subject of his first single. The group at this time drove to gigs in an ambulance with a large pink crocodile on top. There were various line-ups of The Savages during the sixties who included Ritchie Blackmore (gtr) (later of Deep Purple), Matthew Fisher (organ) (later of Procol Harum) and Paul Nicholas (piano). His second single, Jack The Ripper, wasn't a hit but was popular on juke boxes of the era, where he could be seen in a top hat and long black cloak, carrying a butchers knife chasing young maidens. His first six 45s were all produced by Joe Meek. They included some old favourites, like Little Richard's Good Golly Miss Molly, the classic The Train Kept A Rollin' and the R&B favourite Honey Hush. Their first 'A' side not produced by Meek in 1966, The Cheat, had a slow psychedelic feel. In 1965 he formed his own National Teenage Party and stood as a parliamentary candidate for Stratford-Upon-Avon on a manifesto of reducing the voting age to 18 and abolishing dog licenses. Nowadays, of course, he makes a point of standing in all by-elections with his Monster Raving Loony Party. He also attempted to start his own pirate radio station in the sixties. 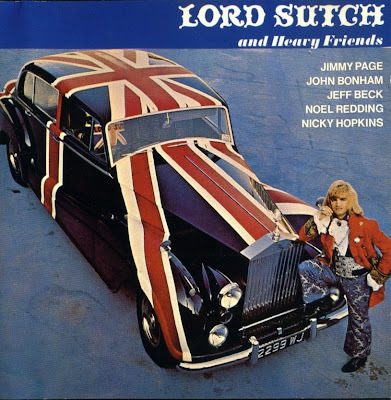 Much of his act was taken from black American singer Screamin' Jay Hawkins but Sutch lacked Hawkins' vocal power which is probably why real commercial success eluded him. Not even the backing and support of individuals like Jeff Beck, Blackmore, John Bonham, Nicky Hopkins, Jimmy Page, Noel Redding and Keith Moon, when he recorded a couple of albums in the seventies could compensate for this.